Squash House Quilts: Things are Popping up All Over! Mr. Squash and I have been doing a little work in the garden (well, if you ask Mr. Squash he might say he is working like a rented mule - lol), that is between surprise snow and hailstorms! That's right - on Tuesday morning we awoke to snow coming down and sticking! I guess Mother Nature isn't quite done with the cold weather. As I write this I hear thunder in the distance! I did a little walk around the garden with my camera yesterday afternoon. 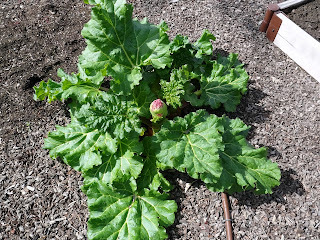 Look at the rhubarb! That pink thing is a seed pod and as I lifted the leaves I found four more! I take them off so the stalks can have all the energy from the plant! Soon we'll be eating rhubarb crisp! 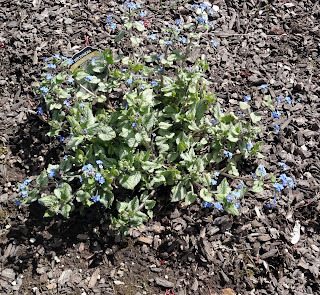 The delicate blue flowers of Brunnera took me by surprise! I must have walked past this plant a dozen times and just now noticed the blooms! 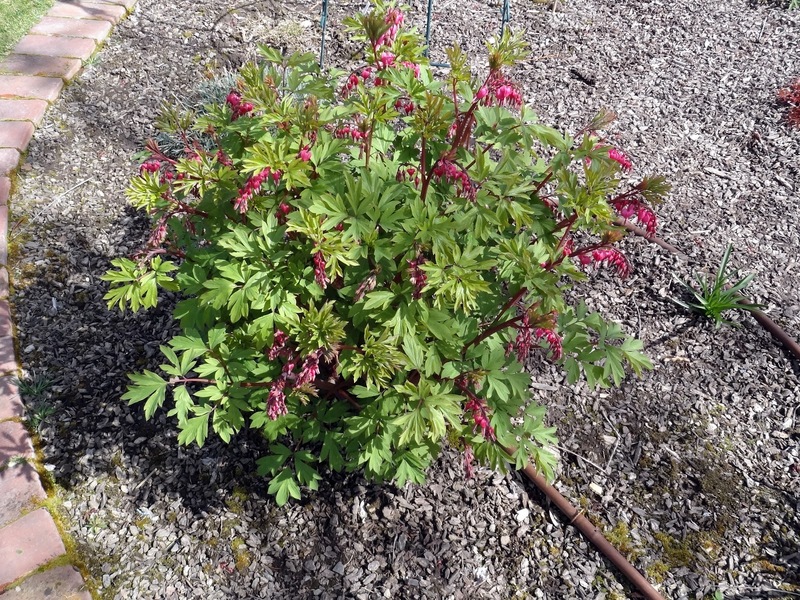 This Bleeding Heart is about to burst out in song! 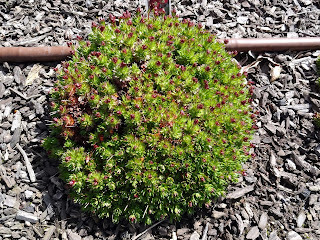 It was a tiny plant last year and is now about 18" tall and is just beginning to bud out! 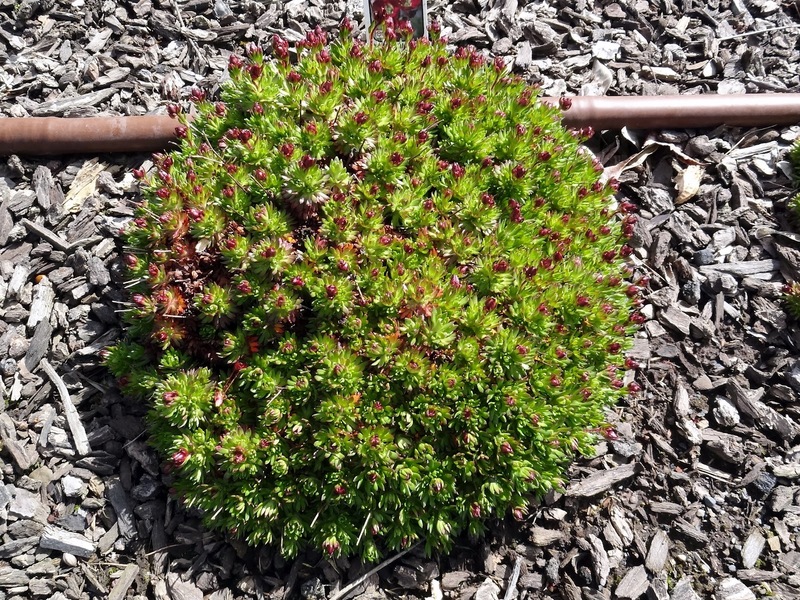 There are 5 mounds of Saxifrage just getting ready to pop into pretty, pink flowers! Check out the Heuchera. The former owners left us these two beauties! 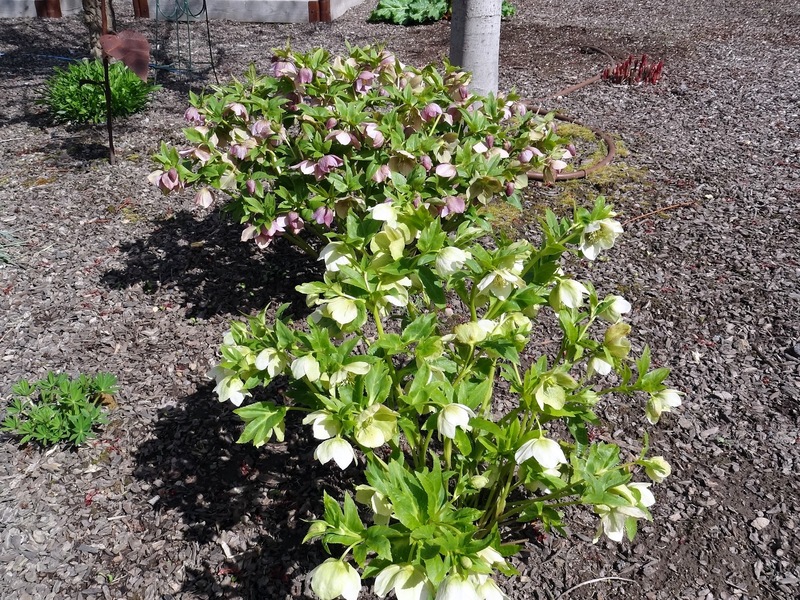 Behind them to the right is Ms. Peony, just coming out of the ground and to the left is a little Foxglove I planted last year. The daffodils on the west side of the garage are sort of on their downswing. They weren't very prolific this year, but still lovely to see! 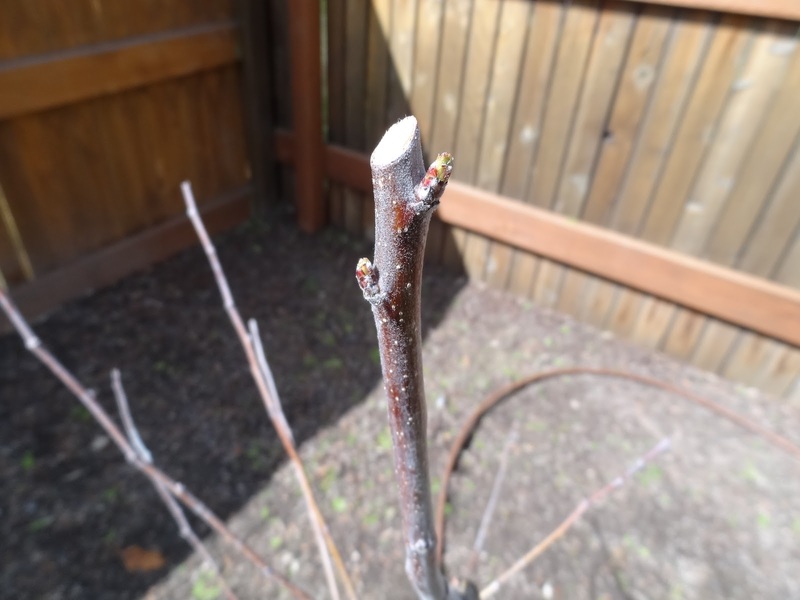 This makes me extremely happy - my semi-dwaf, Honeycrisp apple survived the winter and as you can see here, is just beginning to set new leaves and branches! Our Spanish gardener who used to work in the apple orchards gave me a lesson on how to prune it the other day. It is joined this year by a semi-dwarf Ginger Gold apple on the other side of this area. I hope they have a long and happy life together! A cold snap has seem to set in here in the Deep South today. We bought all our tomato and pepper plants yesterday but couldn't put them in because of all the rain. Maybe it was a good thing! Don't you just love the subsequent years with the perennials? They just keep getting more beautiful each year! Oh Candace, I don't think I can say this with enough emphasis for how I'm feeling - this is super cool. Just wow!!! Prettiness all over the place. My bleeding hearts are in their full glory. Rhubarb crisps, apple pies...I'm coming to your house. Love all of your (early) spring blooms. I need to go check on my bleeding hearts - they are among my favorite - so pretty! Hope you get lots of apples one day. I have never eaten rhubarb. All the other plants are looking good. I just love spring. Yes. 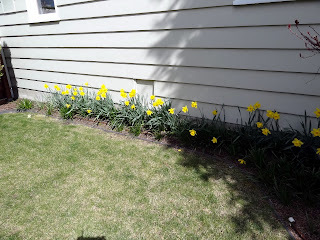 things are popping up everywhere...enjoyed your pictures. You both must have green thumbs! Beautiful pictures from your garden. - We keep getting new snow on top of the old. There's got to be more than four green thumbs living at the Sqaush house! I am also enjoying the tiny blue flowers on my brunnera. 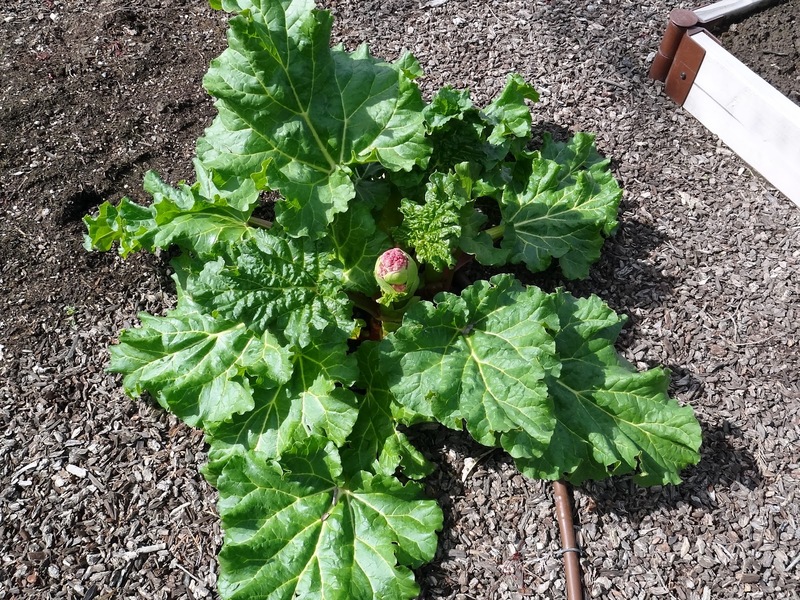 I did not know that rhubarb has seed pods. I'm thinking of planting a rhubarb.